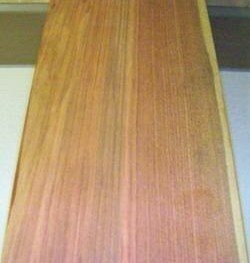 Kiln dried, Rough, Random widths 3"+, Lengths 3' & Longer. COLOR DETAILS: Varies from bright water melon red to orange/pink or violet with darker streaks. The vibrant color will fade quickly if not protected with UV inhibitors. WEIGHT: Approximately 4.5 lbs. 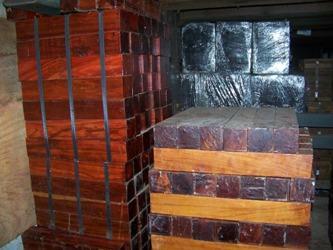 per board foot kiln dried. WORKABILITY: Machines, planes, sands, turns, glues and finishes well. Tight grained, relatively light and on the soft side. The name Redheart or Chakte Coc (Chackt Kok) can be confusing due to a number of different trade names that it is marketed under. 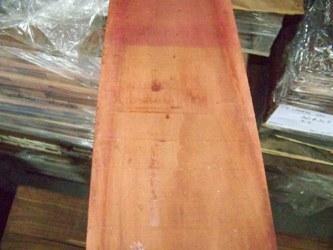 Wood Vendors offers Chakte Coc or known botanically as Sickingia salvadorensis from Mexico. The specie is known for it's amazingly vivid, fresh cut appearance which can be anywhere from Bright Water Melon Red to a more subdued reddish pink but fading quickly to a tan or brown unless protected by a UV inhibitor. Call Pat or Tom today at 1-877-983-6367 to discuss your Redheart options.